Volume 1 Ratatouille Rescue Dawn Santa Clause 3: The Escape Clause Shrek The Third Superbad Vitus Who's Your Caddy? 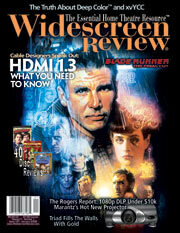 I read WSR to keep current with the latest A/V gear and technology, gain greater understanding of what's relevant to having a great home theatre, and filter out what's not. Learning that there are levels of quality product (not just bound by price), and once quality is established, it's more about how sight and sound appeal to individual taste.